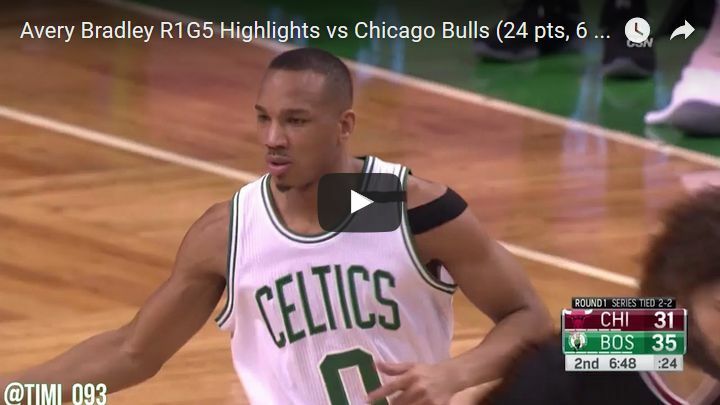 Avery Bradley scored team-high 24 points to go along with six rebounds as the Celtics beat the Bulls in Game 5 of first round playoffs series. Bradley started hot and stayed this way throughout the whole game. His defense on Jimmy Butler was also the key for victory for the Celtics. 24 points is a new playoffs high for Bradley. Hopefully he can set a new career high soon! Al Horford flirted with a triple-double, posting 21 points, seven boards and nine assists as he continues his stron postseason play. Horford came up huge in the fourth quarter, scoring 11 of his 21 points in that span. Big game for Big Al! Isaiah Thomas also finished the game with 24 points, adding five rebounds and four dimes to his total. Isaiah's 3-pointers weren't falling that night but he still found the way to contribute. Thomas was perfect 11/11 from the free throw line and scored 11 points just in the fourth. Kelly Olynyk chipped in with 14 points on his own, being the best Celtics' scorer off the bench. Olynyk is at his best when agressive and his play really helped Boston team on Wednesday night.